I love a good rollerball fragrance. (Seriously, check out the proof here.) So when I found out that Thymes Moonflower Cologne came in rollerball form, I was beyond excited. For starters, the rollerball itself is gorgeous. A sweeping floral motif encases the miniature but substantial bottle so elegantly. The perfumed fragrance is packed with gold shimmer, which leaves just a subtle trace of glimmer upon the skin for a beautiful luminescence. Notes of gilded cinnamon, clove, sugared quince, myrtle leaves, mahogany, dark amber and cognac suggest the feel of twilight approaching. 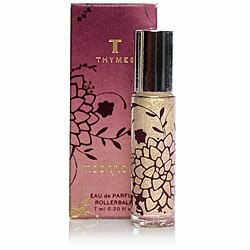 And today, one lucky winner has the chance to receive the Thymes Moonflower Cologne Rollerball, valued at $20! To enter, place your name and email address in the box below. The winner will be selected on Wednesday, August 25 and notified by email. This giveaway is open to US residents only. Giveaway runs until Tuesday, August 24 at midnight. One entry per person, email address and IP address. Multiple entries will be disqualified. I am always glad when you tweet about your giveaway because I have nearly forgotten to enter a few times. I go to your blog almost every other day but a few times I've been slacking! PS I also think this roller ball is GREAT! And have many roller ball fragrances myself. Yay! I filled out the contest machine form with my address! Thank you so much!! !